Oklahoma Connection | Guthrie was born and raised in Okemah, Oklahoma. 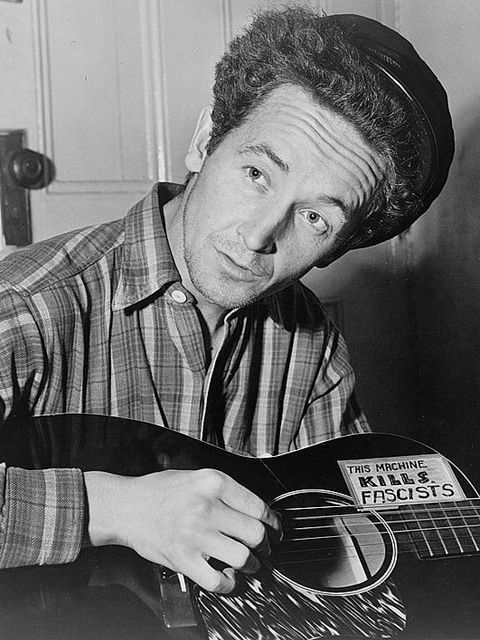 Woody Guthrie wrote over 3000 lyrics in his lifetime, most of which he never recorded, penned two autobiographical novels, and drew more than 500 illustrations. Oklahoma native Woody Guthrie left Okemah, Oklahoma, for Pampa, Texas, in 1931 and formed The Corn Cobb Trio, marking the first step in his historic career. Guthrie arrived in California in 1937 and eventually settled in New York City in 1939. Guthrie published his first novel, Bound for Glory, in 1943. Guthrie was a poet-philosopher of the common person who reinvented American folk ballads as a vehicle for social commentary and protest with such songs as “This Land is Your Land,” “Pastures of Plenty,” and “So Long, It’s Been Good to Know You.” His song, “Oklahoma Hills,” has been declared the official state folk song by the State of Oklahoma. Guthrie was inducted in The Songwriters Hall of Fame in 1971, The Nashville Songwriters Hall of Fame in 1977 and the Rock and Roll Hall of Fame in 1988. He received numerous awards, including the United States Department of the Interior’s Conversation Award in 1996, the Folk Alliance Lifetime Achievement Award in 1996 and a GRAMMY from the National Academy of Recording Arts and Sciences in 1999. Guthrie died at the age of 55 from Huntington’s Chorea. See pictures of Woodrow Wilson Guthrie and other media HERE.